Rheological Tests performed at Plastics Technology Laboratories, Inc.
Plastics Technology Laboratories, Inc. PTLI, the leader in plastics testing provides numerous rheological tests to measure the viscosity of a polymer ranging from single point tests like Melt Flow Rate (MFR) and Melt Flow Index (MFI)(ASTM D1238, ASTM D3364, ISO 1133) to sophisticated variable shear rate tests like Capillary Rheometry Shear Sweeps and Thermal Stability (ASTM D3835, ISO 11443). Tests are performed while the polymer is in the melt phase for MFR, MFI and Capillary or while the polymer has been dissolved in a solvent for Intrinsic Viscosity (ASTM D2857) and Relative Viscosity (ASTM D2857, ISO 489). Nearly, every Rheology test is A2LA Accredited and is performed on state of the art equipment to assure that you receive the accurate and precise results you require, and our turn around times cannot be beat. Industry leaders rely on PTLI to determine rheology properties for degradation studies and to determine molding parameters and performance. Understanding the rheological (flow) properties of a polymer is important to the processing engineer in order to obtain the optimum properties from materials during the molding process. Rheology is also important after the molding process often indicating whether or not the material was indeed processed properly, meaning little or no degradation. 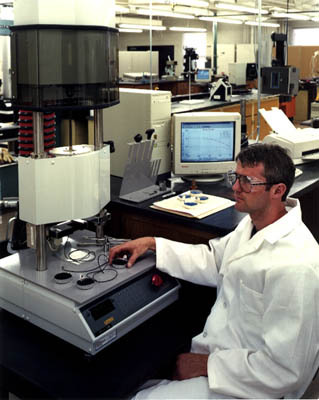 When it comes to Rheology Testing PTLI is truly The Leader In Plastics Testing with 20 years experience and full capabilities. For a Quote on these or any other tests Click Here. For a Quote on these or any other tests Click Here.